Haile Selassie is being honored today with a statue of his likeness unveiled at the African Union's headquarters in Addis Ababa, Ethiopia. He is being honored for his role in establishing the African Union's predecessor, the Organization of African Unity (OAU). The first meeting of the OAU was in Addis Ababa in May of 1963. Emperor of Ethiopia Haile Selassie I was believed to be the reincarnation of Jesus Christ. 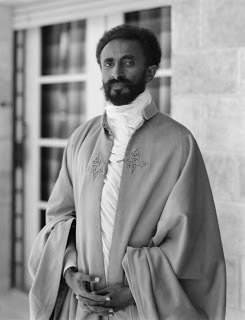 Selassie had served first as regent of Ethiopia from 1916 to 1930 and was emperor from 1930 to 1974. He was the heir to a dynasty that traced its origins to the 13th century, and from there by tradition back to King Solomon and the Queen of Sheba. At the League of Nations in 1936, Emperor Selassie condemned the use of chemical weapons by Fascist Italy against the people of Ethiopia. Ethiopia was the one independent African state during a time when the rest of the continent was under colonial rule. H.I.M. Haile Selassie , the lion of Judah, resisted the Fascist invasion of his homeland Ethiopia and warned the world of its threat when he addressed the League of Nations. He would go into exile in Great Britain but returned home after the defeat of the fascists. 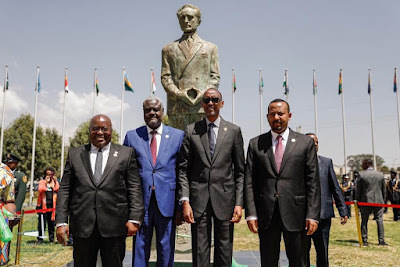 Emperor Haile Selassie's internationalist views led to Ethiopia becoming a charter member of the United Nations, and his political thought and experience in promoting multilateralism and collective security are still viewed as part of his enduring legacy. Despite inspiring the founding of a religion that today has up to 800,000 followers he remained an Ethiopian Orthodox Christian until his death. Emperor Haile Selassie was deposed in a communist military coup and it is believed that the officers smothered him and that Mengistu Haile Mariam: "ordered the emperor's body to be buried head down in the palace and had a lavatory erected over the grave so that he could express daily his contempt for the monarch." Winston Churchill had described Emperor of Ethiopia Haile Selassie I as "the only enlightened Abyssinian prince." In December 1994 The New York Times reported that an Ethiopian court described "how Emperor Haile Selassie was 'strangled in his bed most cruelly' in 1975 by order of the leaders of a Marxist military coup." 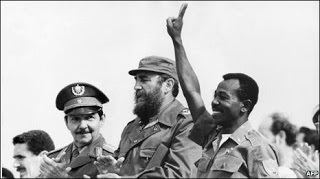 Fidel and Raul Castro were both deeply involved in sending 17,000 Cuban troops to East Africa in assisting Lt. Col. Mengistu Haile Mariam in consolidating his rule and eliminating actual and potential opposition in Ethiopia. Mengistu participated in a successful military coup against the U.S.-backed Emperor Haile Selassie in 1974, eventually seizing power on Feb. 3, 1977,by massacring his rivals in the officer corps. Castro admired this bloody deed as a preemptive strike against “rightists” that showed “wisdom” and cleared the way for Cuba to support Mengistu “without any constraints,” as he explained to East German dictator Erich Honecker in an April 1977 meeting whose minutes became public after the fall of European communism. [...] With the Cuban forces watching his back, Mengistu wrapped up his bloody campaign of domestic repression, known as “the Red Terror,” and sent his own Soviet-equipped, Cuban-trained troops to crush a rebellion in Eritrea. The last Cuban troops did not leave Ethiopia until September 1989; they were still on hand as hundreds of thousands died during the 1983-1985 famine exacerbated by Mengistu’s collectivization of agriculture. Mengistu fled into exile on May 21, 1991. Less than a decade later on November 5, 2000, Haile Selassie was given an Imperial funeral by the Ethiopian Orthodox church. Bob Marley's widow, Rita Marley, participated in the funeral.